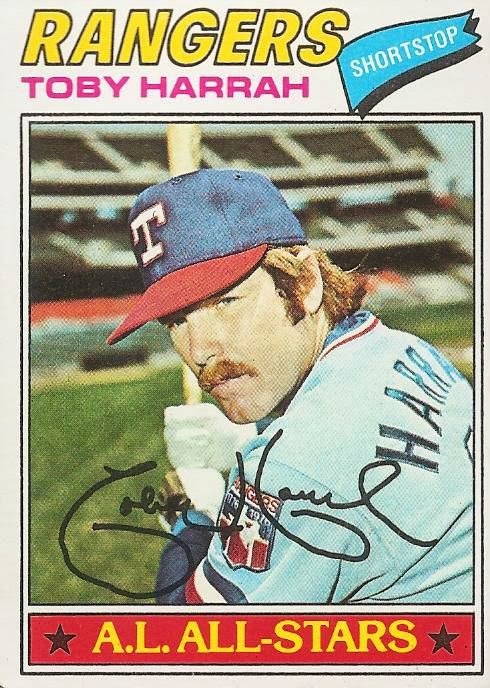 Texas Rangers Cards: 1977 Topps - Toby Harrah. By 1977 Toby Harrah, shown here on Topps card #301, was a star with the Texas Rangers. He had developed power at the plate and secured the starting shortstop job. The position designation on this card and the All-Star banner are both referring to 1976. Things would be a bit different in 1977. With the arrival of free agent shortstop Bert Campaneris and a hole developing at third base, the Rangers moved Harrah over to third beginning in Spring Training. The move meant he had to learn a whole new position but the front office was sure he had the reflexes and baseball instincts to do so. Harrah played just one inning away from third in 1977, a cameo appearance at his old position, shortstop. The rest of of the season he played 1404.1 innings over 159 games at third base. Apparently the move had not hurt his durability. Toby committed 15 errors in 401 chances during the season. That worked out to a .963 fielding percentage - six points higher than the league average. All in all it looked like Harrah made the move to the hot corner just fine and had little trouble in nailing down the starting gig there. Toby suffered a bit of a downer season at the plate in 1976 and he needed to get his numbers back up. He made 673 trips to the plate in 1977. His .263 batting average was just three points higher than the previous season. He led the league in walks though with 109 and that helped raise his on-base percentage 33 points to .393. He also found the power switch as demonstrated by his 25 doubles, 5 triples, and 27 home runs. Those were all improvements over 1976 with the most significant difference being in the longball category. The production raised his slugging percentage over 100 points. Toby also continued to run on the bases with 27 thefts while being caught just five times. Over all Toby Harrah had a better season in 1977 than he had in 1976. He didn't go back to the All-Star game though. That was not due to any trouble Harrah encountered in switching positions. The move seemed to have worked out just fine for both him and the Rangers.